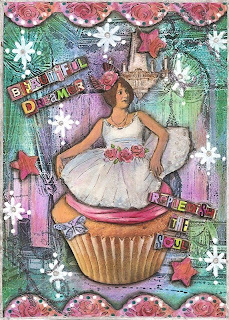 "Beautiful Dreamer" is my second entry for the Crowabout challenge's 50th week celebration. In honor of this auspicious occasion, the talented and creative Nancy Baumiller gave us three super collage sheets and asked us to use them for two weeks to create as many as three separate entries. I've only managed time enough to create two pieces, and both of them were created as a tribute to Nancy's vision for this awesome group. 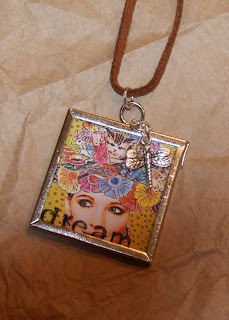 "Dreamer" was also created as a tribute to each of the talented artists who participate in this group. Each week brings a gallery of wonderful creations, each with it's own distinct personality. Some are serious, some gorgeous, some wacky and some are downright outrageous. Yet all are created in a spirit of artistic camaraderie and fun. We all use the same images; however, the results are always surprising! If you'd like to learn more or participate in our Crowabout group, just click here or click on the "crow" on my sidebar. 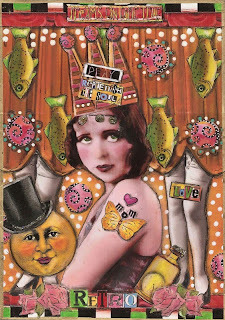 Additionally, Nancy will be holding an "Art Journaling Workshop" that will begin in October. All of that information is posted there too. Congrats and thanks again, Nancy! Wishing you a day filled with creative fulfillment! 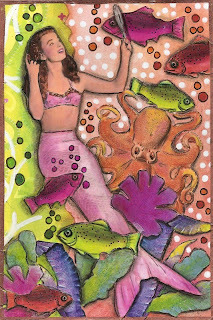 "Under the Sea" is my colorful entry for this week's theme of "fish" at Sunday Postcard Art. My collage began with the beautiful image of the mermaid and the funky octopus (both from Itkupilli), a watercolor background and a piece of scrap paper. All of the images were resized in a photo editing program, printed, hand trimmed and glued piece-by-piece (the old-fashioned way). Special thanks to Nancy Baumiller for the image of the fish and to Flickr's DutchClogs for the assorted pieces of seaweed. Because you loved her . . . Happy Friday! 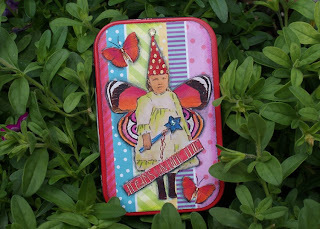 Thank you, thank you to everyone who left such lovely comments about my "Destiny" ATC in the previous post. Your sweet words of encouragement made my heart sing! 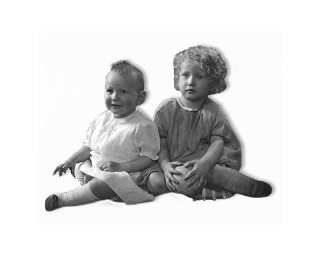 You know how much I love vintage children, and I was intrigued with these two little darlings - each from a different era. 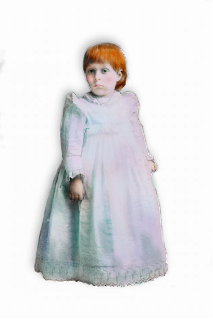 Because so many of my visitors commented on little "Destiny", it gives me great pleasure to share her with you so that you can use her for your artful pleasure. I created each of these sweetie pies as .png files (that means that the background is transparent); however, you can save them as regular .jpeg files. And, because we all love choices, I've provided the black and white version of the first little sweetheart too. "Destiny" was created for this week's challenge at the Three Muses to include a "hand" in our artwork. I was captivated by the picture of this little girl and have always been intrigued by the part the Fates play in our lives. This young girl has no idea of what the future might hold for her or where her life's journey may take her; hence, the many doors and subtle "hand of Fate" in this piece. Admittedly, it's not very often that I choose to do a completely digital piece for a challenge. Generally, I size my images in a photo editing program, print them, and cut and paste the old-fashioned way to create my collages. However, when I found the original, black and white image of the girl and the fortune-telling palm, I started to "play" and one thing led to another . 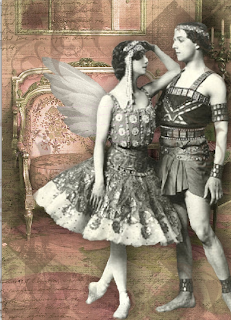 . . before I knew it, I had a finished, digital ATC! May the Fates smile upon your day! Credits & Techniques: Background image from Itkupilli was enhanced with digitally air-brushed color and custom brushes. 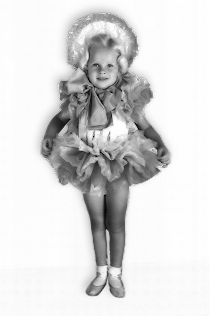 Special thanks to Arteology for the original black & white picture of the little girl. She was altered and digitally colored in Corel Paint Shop Pro. Custom palm brush was created with a picture from Flickr's Jersey Barb85. Grunge brushes used for the border are for Corel Paint Shop Pro from DeviantArt. We're celebrating at Crowabout this week. 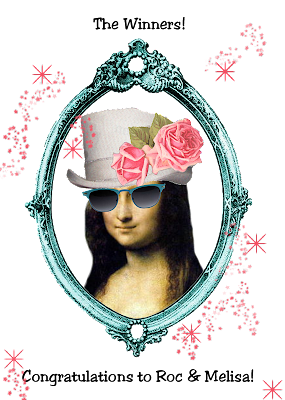 Our gracious hostess and the talented ringleader of our zany group, Nancy Baumiller, has posted the group's 5oth challenge! Quite a cause for celebration, indeed! "Celebration" was created as a tribute and a way of saying congratulations and thanks to Nancy for the generosity and kindness she shares so freely with the many creative members of this artistic group. Week after week, Nancy creates the awesome collage sheets, faithfully posts them for the group's use and artistic pleasure, takes time to comment on individual entries and awards all of the prizes. All of this in addition to running an Etsy shop (click here to go there! ), and now she'll be giving on-line journaling classes too! (Click here to learn more about them!) What a wonder woman! If you think you'd like to participate in the Crowabout challenges, click on the "Crowabout" image on the sidebar. It'll take you to Nancy's homepage, and you can drop her a quick email. Participation is by Nancy's invitation, and she loves meeting and welcoming new artists. Just tell her that I sent you. Again, a big, HUGE, heartfelt thanks and congrats to you, Nancy! You are AWE-some!!! Wishing you a day filled with artful pleasures! I hope that you enjoy this week's "freebies". The picture of the young lady reminds me of a young nanny, and the look on her face makes me smile. You can click on each of these pics to see all of the details. Also, please feel free to post or link pictures of the art that you've created with these pics here. I'd love to see and share your creations! I've been quite remiss in saying "thank you" to some of my dear friends who've been extremely kind and generous over the past few weeks with bestowing some wonderful, and very appreciated, blog awards. The first lovely award came from Cathy at Reflections of a Ramblin Girl, the second beautiful award was received from Marsha at Tumblefish Studio, and the third was gifted by Shelly from Blue Ridge Lady. These are three of the most creative, talented and generous ladies in blogland. I'm happy to accept these great awards, but more than that, I'm thrilled to call each of these great ladies a friend. Theoretically, I'm supposed to pass on each of their sweet awards to a "deserving blog". However, because I enjoy so many of your blogs and treasure each of your beautiful friendships, I personally feel that MANY of you are very deserving of an award. 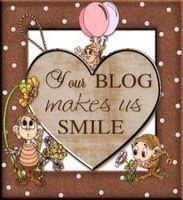 Please take the following award and post it on your blog as a "smile" from me to you! Hope that your weekend is filled with smiles! Fiona always wanted to dance on Broadway, so when the occasion arose to audition for "Fearless Freddy's Fantastic Fish Follies" she couldn't resist. Fiona was thrilled when they offered the job, hoofed her way to stardom in the chorus line and never looked back - although she does admit that she misses her Mom now and then! "Broadway Baby" was originally created for this week's Crowabout challenge. However, because this week's challenge at The Three Muses is to put "wings on something", I think that Fiona's tatoo qualifies this piece for that challenge too! Wishing you a day filled with dance and delight! Credits: Approximately eight of this week's Crowabout images were used, along with bits and pieces from past challenges. The curtain came from a Flickr sharing group, and the hat and Mr. Moon are from Flickr's ArtsyFartsyQueen. 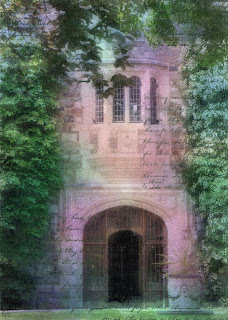 Special thanks to Donna and Mandy at Sunday Postcard Art for asking me to be this week's guest artist. My chosen theme is "glamor". The epitome of glamor for me is the romantic period known as the cafe society in Paris during the 1920's into the early '30's. 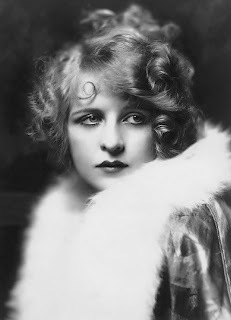 Elegant women wore silks, satins, pearls and furs. This is the era of Coco Chanel, the Moulin Rouge, intrigue and mystique. Hope you have fun playing along! My Techniques & A Surprise "Freebie"! 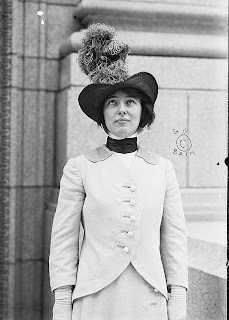 This entire piece began with a wonderful background from Jack and Cat's Curio (Flickr), and the gorgeous lady (from the Library of Congress). 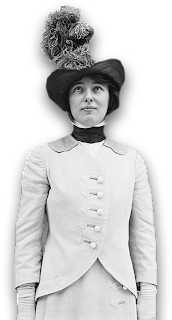 The background of the lady was digitally "cut away"to make a .png file, added to the Paris background and digitally colored. The chandelier was scanned from a magazine and digitally placed on the background. 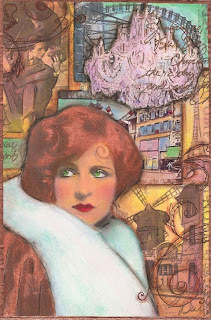 After printing the digital collage, additional color was added to the entire piece with watercolor washes, pan pastels and Prismacolor pencils. Shadows were added with smudged charcoal pencils and Prismacolor pencils. The flourishes were stamped with brown Stazon ink, and the entire piece is edged with a copper-colored border. Hope you experience a touch of glamor in your day! Giveaway Winners & Friday "Freebies"
Again, my sincere thanks to all of you, my blogging sisters, for making me feel so special! background and wings from Itkupilli. that I made from one of my recent photos. I fell in love with this door! I hope you have a lovely weekend that contains a just a hint of romance (or chocolate)! Retro Fairy & A Reminder! 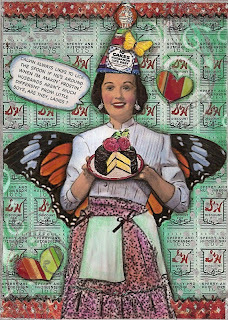 My retro fairy fulfills the challenge at The Three Muses for their hat theme and is my entry for this week's Crowabout challenge. Many in the States will recognize the background of S&H trade stamps that were known as "green stamps". The iconic S&H stamps were one of the first consumer award programs and were given to reward purchases for food, gasoline, etc. in the late 50's and 60's. Woman saved their green stamps in books and took boxes and bags of them to redemption centers to trade for all types of household items. I have fond memories of my Mom, my sister and I, sitting around the kitchen table arduously licking tons of these stamps, placing them in the books meticulously, and proudly sporting green tongues. Holy Cow! I can't even begin to think of the quantities of green dye that we ingested! When I saw this week's Crowabout images, the retro lady with her baked goodies spoke to my childhood. If my Mom wasn't saving her green stamps for china and crystal, she was baking. And, yes, we had great fun vying for our turn to lick the frosting and batter bowls. Thanks for the memories, Mom! 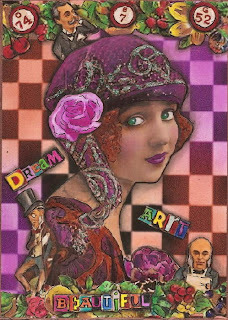 My retro lady was given wings (from Dover Publications), and digitally composed and arranged on the S&H background (stamps courtsey of Flickr's (Takeabreak). Six of this week's Crowabout images were used, including the teeny-tiny digital earrings made from the frying pan. 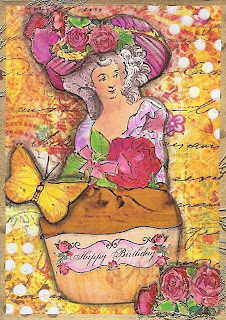 The butterfly and roses were added as feminine embellishments (Cassiscreations - Etsy), and the little hearts were made from scrap paper. The background was color enhanced with watercolor washes, and I added a bit of stenciling with white acrylic paint. Unfortunately my scanner did not read the pretty sparkle flourishes that overstamp the striped heart corners. (They were created with a sparkly embossing powder.) A bit of glitter was added to the party hat, the earrings, the cake plate and the apron. Once again, my scanner failed to read the glitter. Dots were added to the background with silver metallic marker, and the same marker was used to edge the finished piece. Just a quick reminder about my current giveaway to celebrate my 101st post. You still have time to enter the drawing by clicking here and leaving a comment on that post. The winner will be announced this Friday, August 14. Good luck to all! Hope you have a day filled with sweet memories! 101st Post & A Giveaway! I can't believe that this is my 101st post! When I started started blogging in January, it began as a personal experiment. Believe me when I say that I had no idea how long it would last, where it would lead or its significance in my life. Because I said, "Why not?" and took a chance 101 posts ago, my life has been enriched beyond measure. Each post has lead to new friendships and discovery. It's been a remarkable journey - artistically and personally! Almost eight months and 101 posts later, I honestly don't know what I'd do without you, my wonderful blogging buddies and friends. I am filled with gratitude for your love, support and encouragement. Thank you, thank you too, for all of the congratulatory comments left on the my 100th post. You're Awesome!!! 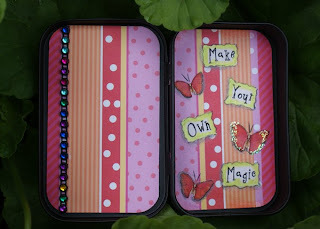 In celebration of this blog-accomplishment, and as a way of saying "thank you" for your comments and blog-a-licious love, I'm giving away "Magic", an altered (Altoid) tin, and a lovely necklace that features one of my earlier Crowabout pieces, "Mother Nature". To win, just leave a comment on this post, and you're in it to win it. That's all you have to do! Pretty easy! The winners (chosen by Random.Org) will be announced on Friday, August 14th. If you've been quietly lurking behind the scenes, this is a great time to step into the light. Please help me celebrate by introducing yourself. I'd love to make a new friend or two! Good luck to all! Hope you have a lucky and blessed day! 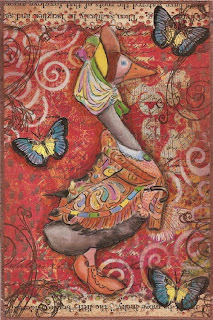 "Mother Goose" - My 100th Post! For many reasons, this post has great significance for me. You are visiting at a wonderful time, because this is my 100th post! I just can't believe how time has flown. Additionally, it's very significant that the theme for Sunday Postcard Art is "nursery rhymes". Believe it or not, "Mother Goose" has been extremely instrumental in my life and career. Now it's time to choose yet another career path. As a "woman of a certain age", it's become increasingly more difficult to climb ladders and remain in one painting position for hours without needing a ton of Tylenol (at the very least!). I've been wrestling with the decision to move forward for some time. Fear and doubt have paid a return visit. But when the nursery rhyme theme appeared - almost magically - I viewed it as a sign from the Universe that it's time to reinvent my career, sell my trusty ladder and move on. I'm not sure where I'm headed, where it will all lead or even if my work has any merit. All I know is that there are many colors and images within my soul just waiting to be released, and it's time to begin a new journey and travel down a new path. Today I'll focus on the background only. 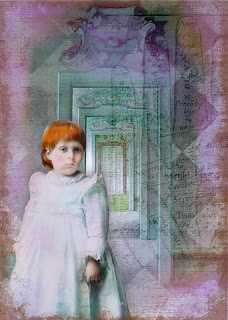 The thought was to create a "vintage looking" background for the great Mother Goose image. I began with a piece of scrap paper, stamped it with faux writing (using Stazon ink), and enhanced some of the areas with watercolors. Swirls were then added with a swirl stencil and white acrylic paint. After the images were glued down, dots were created with a copper metallic pen, and flourishes were double-stamped with brown Stazon ink. FYI, the top and bottom borders were created from a vintage page with a doily punch (Martha Stewart). The entire finished piece was brushed and stippled with tea-colored distress ink to add to the vintage look, and edged with a copper metallic marker. If you have an opportunity, check back to read my next post. Hint - There will be a giveaway to celebrate my 101st post! Hope you have an fearless day! Credits: Mother Goose is from a Flickr photo sharing group , and the blue butterflies are from Dover Publications. Although a bit late, I'd like to give a big shout out to a few friends who have celebrated Birthdays during the last few weeks. It seems as though this is a very busy Birthday time of the year. If you have an opportunity, please stop by to visit each of these beautiful, talented and creative Birthday Girls. It's never too late to give a little Birthday love! Happy, Happy Birthday to Michelle from Lost Coast Post, Carolyn from Vintage Pix, Peggy from Peggy's Mixed-Up Art, and Renee (she doesn't have a blog, so click here to see her art in FLICKR). I hope that you all had a wonderful Birthday filled with love, laughter and sweet memories. May you have a wonderful year filled with personal and artistic fulfillment, good friends, and good health. And, I hope that all of your Birthday wishes come true! I have a very soft spot in my heart for vintage pictures. 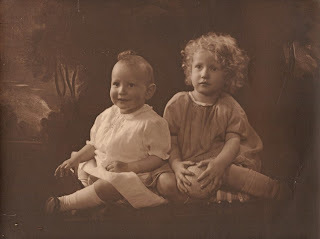 And I adore the images of vintage children. I can't help but wonder what became of these little tykes. The first picture was a recent lucky find in an antique store. I've provided a .png file as well as a scan of the original print to do with as you please. 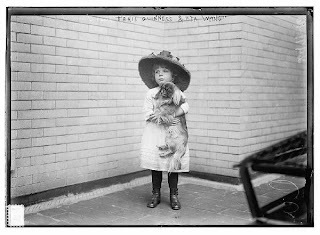 The second picture of the little girl with her furry friend was found in the public domain. Enjoy! The look on this poor chef's face reminded me of the time my husband flam bayed an entire roast chicken beyond belief on the barbecue. In the process of cooking it on the rotisserie, one of the little "wings" got stuck when he closed the lid. The rest (as they say) is history. Of course, it was a holiday weekend. Of course, the grocery's were closed. Of course, we had a house full of hungry guests. We still laugh about the infamous chicken incident! Ten of this week's Crowabout images were used in this collage. Each of the images was resized in a photo editing program, printed, trimmed and glued to a background created with Twinkling H2O's and acrylic paint. After arranging placement, the entire collage was color enhanced with watercolor washes and Prismacolor pencils. I finished this collage by stamping flourishes with brown Stazon ink and added background dots and edging with a gold metallic marker. Hope you have an uneventful day! 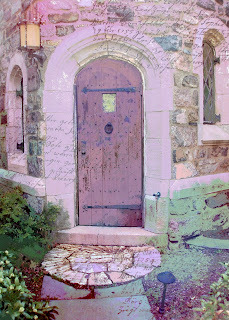 Credits: Ten current images and several images from past challenges are from Nancy Baumiller's Flickr Crowabout Group (I'm a member!). The little gnome is courtesy of Flickr's Artsy Fartsy Queen. 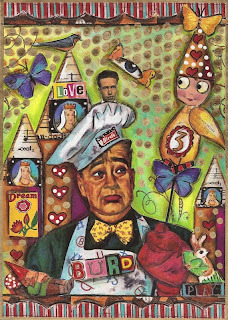 The images of the chef and the googley-eyed girl are from Clotho98 (Flickr photo sharing group); the yellow butterflies are from Cassiscreations (Etsy), and the blue butterflies are from Dover Publications. All of the images were sized in a photo editing program. Queenie, the colorful bingo card background and the bingo numbers were all digitally arranged. The digital collage was printed, and the butterflies, scalloped edging (made with a paper punch) and rose were glued into their positions. After enhancing some of the images with watercolors, Prismacolor markers and pan pastels, shadows were added with a smudged charcoal pencil. 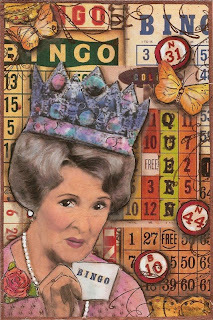 White acrylic paint was used to create Queenie's pearls and to add highlights to the bingo numbers. The word "queen" and the flourishes were stamped with brown Stazon ink. The entire piece was edged with a copper-colored metallic marker. Credits: Bingo background from Jack & Cat Curio (Flickr); Queenie from Nancy Baumiller's Flickr Crowabout Group (I'm a member! ); Queenie's crown courtesy of Flickr's Artsy Fartsy Queen; bingo numbers from Monkey123 (Flickr photo sharing group); butterflies and rose from Cassiscreations (Etsy). Thanks to all for these great images!